Writing mappings for models in large application is quite boring task. Fortunatelly, Fluent NHibernate provides possibility for automatic mapping creation – so called automappings. In order to show you, how to configure automappings in Fluent NHibernate, let’s create simple database along with model classes. The database structure is presented in the picture below. Having our database and models prepared, now we can create and configure SessionFactory to use automappings. As You can see I used the static AutoMap.AssemblyOf method. This method takes a generic type parameter from which Fluent NHibernate can deduce which assembly to look in for mappable entities. 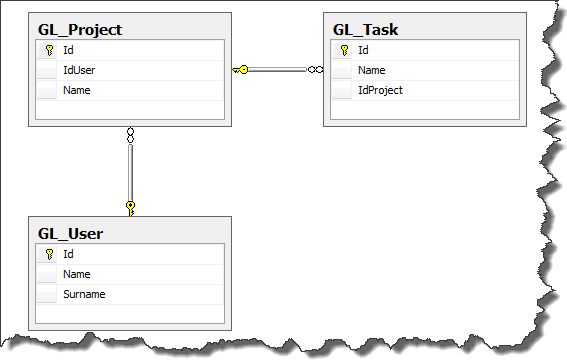 From now all classes defined in the assemlby of Project are mapped using build-in convention. It is rather obvious that default automapping conventions may not come along with our database naming conventions. Fortunately we can create custom conventions(which override default ones), and pass them to AutoMap configuration. Here are examples of conventions I use IClassConvention – gives us access to properties and functions which allow us to change a default table name format for our entities. IIdConvention is used for altering default identity conventions. In order to use new conventions we need to pass them into AutoMap configuration. Where can I download the full source code for this tutorial?